Welcome to another day and another blog 🙂 Today, I have the pleasure of being the first to host Raphyel M. Jordan, author of Prossia. This novel has just begun a blog tour, and I am so thrilled to be part of the tour. There is lots of interesting information and some goodies–like a GIVEAWAY!! !–as you read through. Hope you enjoy and will be apt to check out Prossia after reading. I used to write little graphic novels when I was a kid. Drawing’s always been my true love, but I wanted to give the characters I drew a story. So, I’ve been drawing ever since could pick up a crayon, and I’ve been writing stories ever since I knew how to make complete sentences. I mainly focus on YA science fiction. 3. What is the book you recently published? 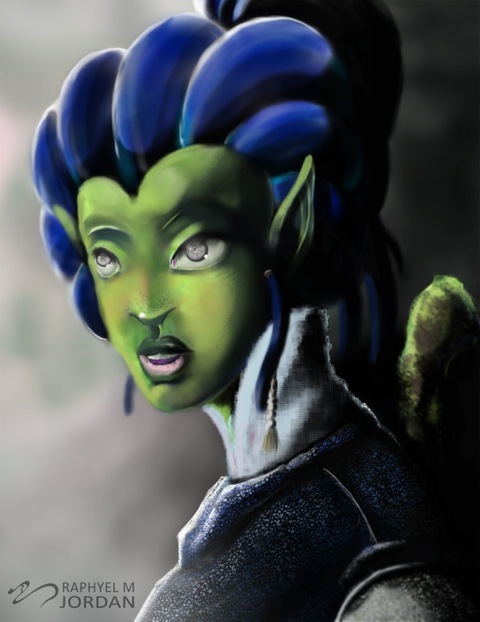 Prossia is a sci-fi coming of age series that shows the potential and responsibility that youth have due to their strengths while learning to overcome their weaknesses. That lesson is learned as we follow a teenage Goolian who unravels secrets about her galaxy while defending it against a renegade alien race. Prossia is currently the only title I have out so far, but that will change by the end of the year. 5. Name your top three favorite characters you’ve made up and explain why they’re your favorites. “I love all of my characters.” LOL. Nah, I won’t give the generic answer. 1. Aly- She’s such a complex individual, like all human beings. Other people can only see the basics of a person, that being what they do and what they say. Still, we can never truly understand all the information and thoughts running all over the place in a person’s head. Like many people, Aly has a personal set of morals that sound good and logical, but she finds it hard to practice them when they’re challenged because she’s facing a personal struggle of the mind. 2. Cy- His mystery alone makes him so interesting. People just don’t know if they’re supposed to root for him or yell at him. At one moment, you’ll sympathize with Cy, and then he does something so unexpectedly horrible, you might wonder why you were ever thinking that people should just leave him alone. 3. Catty- She’s just too fun for me to dislike. Many people think they know just what type of girl she is; the spoiled stuck up kid that always got her way and all the attention. Then it turns out Catty is actually a caring person who will insist to pull her weight along with the person beside her. She’s a tough little cookie with spitfire. LOL! Tough question, actually. The first draft took about a year and a half. (I took a lonnnng break in not working on it.) Then I started implementing items I was learning from college to strengthen the story. 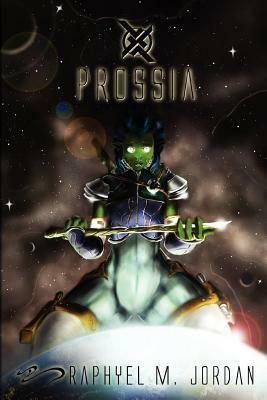 Also, I didn’t want to publish Prossia while I was in school, since graduating was my top priority. So, the book had actually been done for a couple of years in spite of the 2010 release. Challenges brought by my own ignorance of the writing business. Even though the book’s been published for two years, last year felt like the first year Prossia started showing its true potential since I went about marketing it horribly initially. I used to just use Facebook and Deviantart. I just knew my illustrations would intrigue enough people. Guh, what an idiot. Now I’m trying to use the tools of the web as much as possible. Twitter, Facebook, blogging. I even make web ads since I’m a graphic designer and illustrator. From what it seems, finding bloggers that have a sci-fi niche seems to be showing the best direction to building interest for the book. It’s a lot different from what it used to “look” like, thank God. When I first wrote Prossia, I just wrote away, knowing I needed a means to transition from the intro, the climax, and the ending. I actually know a couple of authors that can do that method, but they’re, well, more established. My writing process is now very complex, and much more organized, now that I’ve written more stories (I think I have three solid ones that are just waiting for their time to shine, and numerous others that I’ve messed around with just for the heck of it). Now, I prep the story up with a single sentence that summarizes the story. I find that useful since a lot of agencies ask for a sentence about your story. Then I point out the objective of the story since I tend to have some underlying motif. After that, I write a paragraph for each the intro, climax, and ending. Then I write out summaries of key characters. What they like, what they don’t like, what their relationships are with other characters, and how their persona will progress from the start of the story to the ending. Then we can finally get to the outline, where I summarize every single scene. After the outline is done, I’ll write the actual story, split-screened with the outline so I don’t go off track. I’m working on two projects, Operation: Sand Gnat, and Operation: Pirate Bee. These are simply code names for the actual books until I get comfortable with revealing an actual title. Since Pirate Bee is still a ways away, I don’t talk about it that much, but I do already have monthly ads going on around the web for it. Sand Gnat is what I’m really focusing on right now since it’ll be out this year. 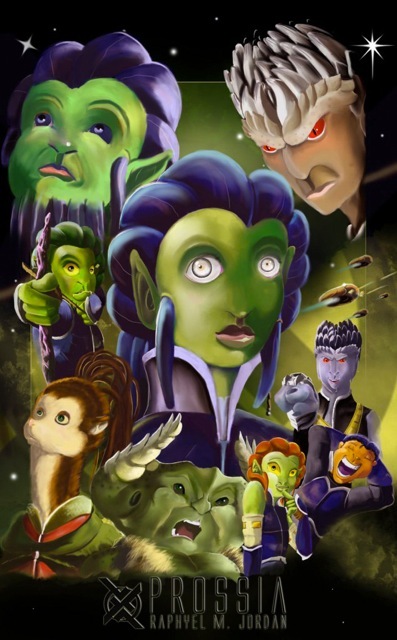 It’s the prequel to “Prossia,” showing Aly and Catty growing up on Planet Gooliun, and how their upbringing led them to the events that take place in “Prossia.” I’m shooting for a November release, so Sand Gnat can coincide with Anti-bullying month, since that will be the social motif for it. Someone felt Aly had too much teenage melodrama since she had instances of insecurity. I found that a little hard because I felt a seventeen-year old who was trying to finish homework one evening, and suddenly gets drafted into a galactic war where she has to kill or be killed, has earned every right to be a little ticked at how her life is as long as she’s willing to fight it out. On the other hand, my best compliment came from someone who said Aly was very relatable, noting that even though she’s not sure of how to confront some situations, she won’t back down. On top of that, the person was surprised that they could relate to this character that isn’t even a human being! Like most authors, I spent a lot of effort, even putting a bit of myself into my protagonist, to make my characters empathetic. And maybe that was why I took a person’s dislike of Aly a bit hard, because when I look at Aly’s thought transition, I see the mirror of me, the 19-year-old kid who was trying to figure out this whole growing up thing by writing some crazy sci-fi adventure. Still, that was my first bad review, and I think that first bad one is always going to “hurt an author’s feelings.” Nowadays, I realize my goal isn’t for everyone to like my characters. That’s impossible. However, I do feel that there might be a small window in which everyone can, at the very least, understand a part of them. It’s my responsibility to make sure the characters are understandable. So, when I hear that someone doesn’t “get” the point I’m making with an individual, I feel I didn’t drive the character’s motivation out enough. In case you couldn’t tell, I’m about character-driven stories. Easy. Stop being an aspiring author, and be an author. Write write write write write, and get that book published! I know the latter part is the more dreadful process, but it’s possible. And if you think age is an issue, it isn’t. People don’t care how old you are. They just want to read a good book. 14. Is there anything you’d like to say to your fans and readers? Sorry for the delay. 2012 was a wake up call, so I’ll make sure you won’t have to wait as long from now on. That’s a promise, and I’m a man of my word. Come November, you’ll have a free book, on me. Are you insane?! I could write an essay on my dorkism! Okay, uhhhh. . . summing it up in words, now! Battlestar Galactica, Dr. Who, Mass Effect, anime, Sonic the Hedgehog, Lord of the Rings, Ender’s Game, Marvel, Astronomy, Star Wars. Need I say more?! Oh! How about a bizarre fun fact. My childhood dream was to become an animator. A sound to Aly’s right made her ear twitch and she had her rifle in her hand before her mind even knew she had grabbed it. She saw some grass rustling in an opening where the sunlight was able to beam down through the trees. There were intense red flowers growing right in the sun’s rays, and a tiny reptile scattered away when it noticed someone was looking at it. Aly sighed and laughed at herself before she headed over to the opening so she could get a closer look at the flowers. She took one step out into the opening, and another creature did the same from the other side. Aly gasped, the Cyogen that was drawn by the music and flowers gasped, and neither budged a muscle. Aly still had her weapon in hand, and the Cyogen only had to raise his gauntlet and fire. The Goolian tried to hide her fear, but to her surprise, the Cyogen looked even more terrified. Waiting, waiting. What were they supposed to do? Aly felt a stream of sweat run down the side of her head. The Cyogen felt his hands shaking. Waiting, still waiting. Both were trapped and looking at death. A flock of birds broke the silence, and Aly’s instincts took over. “Wait!” she heard the Cyogen yelp. Too late. One single shot in the nose, and the Cyogen’s face pulled away into molten flesh before he dropped to the ground. Aly staggered back into a tree and covered her mouth. She wiped the sweat from her head and switched the blaster into pistol mode and waited. She eventually heard rustling coming from behind and took cover. She counted four footsteps, all too light to be hostiles. “Secured,” Aly said, still crouched down behind the tree. A set of red eyes shot its head around the corner, and Aly couldn’t help but yelp as she stumbled back. “I’m sorry. I’m sorry,” she kept saying between her pants. Cy rubbed the mastra’s shoulders, and she took deep breaths so she could calm down. Gruago, Catty, and Juazi came into the clearing seconds later. Catty posted the left, Gruago, took the right, and Juazi checked the Cyogen body. “Is that the only one?” Cy asked Juazi from behind. “Must be a scout,” the lead answered as she nodded. Cy swore and molded on his face plate. “We better take cover then, eh?” he said. Aly and Catty both gasped as their spines sent alarms to their brains. Juazi caught the look in the two’s eyes and dove. 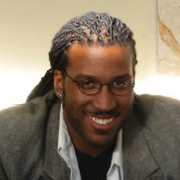 As he studied graphic design at Armstrong Atlantic State University in Savannah, Georgia, Jordan also used his electives to study sciences like Astronomy, Psychology, and Biology in order enhance the reading experience in his story. He eventually made it a goal to have the story published after he graduated, and dubbed the goal “Operation Prosia,” the very same project that would develop into his first published book, Prossia. Even though his novel is not necessarily a religious book, Jordan utilizes his Christian faith by urging people to encourage, not condemn, in his story. Best known for ending his PSFC newsletters with “Unity Within Diversity,” he hopes Prossia’s success will inspire people to consider and support the positive outlook in the difference human kind can share, whether it be race, religion, or any other cultural difference. This entry was posted in Interviews, Writing and tagged Art, author interview, fiction, interview, Interview with Raphyel M. Jordan, Masquerade Blog Tours, Masquerade Crew, novels, Prossia, Prossia Blog Tour, Prossia Book, Raphyel Jordan, Raphyel M. Jordan, Sci Fi, Science Fiction, SciFi, Tamar Hela, Where To Buy Spirit Lake. Bookmark the permalink. Thank you so much for taking part in my blog tour, Tamar! Its first day wouldn’t have been as epic without your help!